This kit has everything to make 3D printing easy and the printed results spectacular. For the hobbyiest, maker and pro alike, you can't go wrong with this deluxe 40 piece tool kit with handy storage and carry tote. 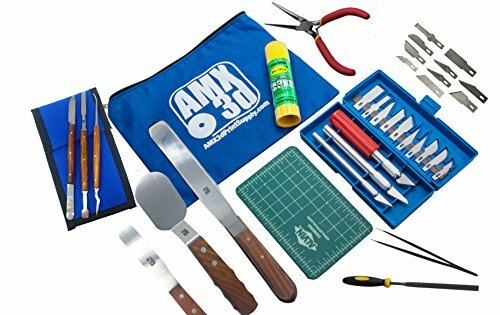 - Our 17 piece hobby knife set & 3" x 5" self healing cutting pad makes it easy and safe to trim the finished models with precision. Set your model on the cutting pad to protect your furniture and ensure the knife blades stay sharp. Also included is a set of 10 replacement knife blades. If you have a 3D Printer or are thinking of buying one - these are the tools you need to make your prints look like those on the 3D Printer Box. The best 3D Prints start with the best tools!